The words of "FOREVER YOUNG" have been sung from many a stage by Bob Dylan over the years. I particularly love the 1981 versions of this beautiful song, one of which I witnessed in Cincinnati. In recent times Bob has been accompanied on vocals by Larry and Charlie a lot, and with this song it sounds really fine. In 1999 "FOREVER YOUNG" was performed only ten times, but in 2000 one out of four setlists included this song. One third of all the 2000 performances Bob has sung in nine consecutive shows from Dublin to Portsmouth in September (before replacing "FOREVER YOUNG" with an acoustic "I SHALL BE RELEASED"). My wife and I got to enjoy all nine of them. In Dublin Bob sang it like a loving uncle giving good advice to his favorite nephews. The raising of his eyebrows while singing "may you have a strong foundation" sure was a memorable sight through my binoculars. In Aberdeen "FOREVER YOUNG" had Bob raising his eyebrows when singing: "May you always know the truth." In 2001 "FOREVER YOUNG" has been performed three times in Japan, three times in Australia, twice in the US (spring), six times in Europe, once during the August US-tour, and fifteen times during the fall tour. Like in the fall of 1981, in Cape Giradeau in April 2001 "FOREVER YOUNG" has been performed in the same concert as "IN THE GARDEN"; and also in the same show as "A HARD RAIN'S A-GONNA FALL", as before in Yokohama in March and in nine shows during the fall 2001 tour. In 2002 "FOREVER YOUNG" has been included in six shows in the USA, and in the first European show in Sweden, where it shared again (after more than 20 years) the same setlist as "SOLID ROCK", as it did a week later in Leipzig. Another week later in Ravenna appeared in first acoustic set, and so it was performed for the first time in the same show as the acoustic "I SHALL BE RELEASED". The next performances of "FOREVER YOUNG" were in Zurich, in Strasbourg, and in Paris; before I had the pleasure to see Bob perform it four times in England, in Bournemouth, in Manchester, in Birmingham, and during the second London show, where it appeared in the second acoustic set following directly "A HARD RAIN'S A-GONNA FALL". The next performance in August in Halifax, Canada was also in the second acoustic set, before in Hamburg, New York, nine days later, it appeared once more in the first acoustic set, just three songs after the live debut of "A VOICE FROM ON HIGH". On the next day in Toronto, Canada, Bob chose to play both songs in that same spot again, even adding "I SHALL BE RELEASED" to the later part of the main set. The next appearance of "FOREVER YOUNG" was in Southampton, where it started the second acoustic set; and the next one was in Edmonton, Alberta. In October "FOREVER YOUNG" appeared in Eugene, again in the same set as "A VOICE FROM ON HIGH"; in Berkeley, two songs after "EVERY GRAIN OF SAND"; in Los Angeles, and in St. Paul. In November it was performed in New York City. In February 2003 "FOREVER YOUNG" was performed during the first show of the year, in Canberra, Australia, which also featured the first "SAVING GRACE" in almost 23 years. Next it appeared in Brisbane and Adelaide; and also once in Auckland, New Zealand. 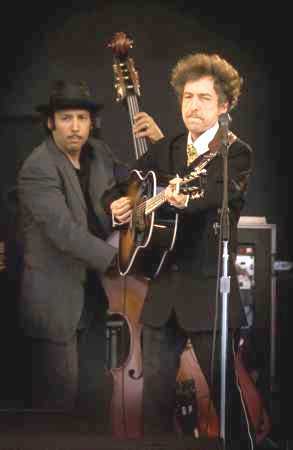 In April "FOREVER YOUNG" was performed as the final encore in Louisville, Kentucky, with Bob on piano and electric guitar. In August, during the last show of the summer tour, in Niagara Falls, Ontario, "FOREVER YOUNG" appeared in the same set as "SHOOTING STAR" and "DIGNITY". In October "FOREVER YOUNG" was performed first in Stockholm, sharing a set list with "EVERY GRAIN OF SAND", on my 40th birthday, both songs being high points of my 41st Bob Dylan concert. On the next day, in Karlstad, my wife and I saw it again. Next it appeared in Oslo, once more in the same set as "SHOOTING STAR". Almost four weeks later a very fine "FOREVER YOUNG" closed the magnificent Düsseldorf show, which had also featured a sublime version of "TRYIN' TO GET TO HEAVEN". The first performance of "FOREVER YOUNG" in 2004 was in St. Paul in March, closing a great 19 song set including "SHOOTING STAR" and "BLIND WILLIE MCTELL". In April "FOREVER YOUNG" appeared as the second song in mighty fine set in Washington D.C., which had started with the first "GOD KNOWS" since 2001, and included gems like "I BELIEVE IN YOU", "I SHALL BE RELEASED", and "TRYING TO GET TO HEAVEN". During the third show in June 2004, in Atlantic City, "FOREVER YOUNG" appeared again as the second song in mighty fine set, which had started with "GOD KNOWS", and which again included "I SHALL BE RELEASED", and "TRYING TO GET TO HEAVEN". During the European tour; which started later that month, "FOREVER YOUNG" was performed in Glasgow, this time in the same show as "TRYING TO GET TO HEAVEN" and "EVERY GRAIN OF SAND". Four days later, in Galway, during a magnificent show which also included both "GOD KNOWS" and "NOT DARK YET", I had the pleausere to witness "FOREVER YOUNG" once again, which unfortunately started with Bob's mike turned off until "... climb on every rung", however it featured a fine harp solo. Three days after the Galway show, Bob Dylan performed "FOREVER YOUNG" in Worms, Germany, in the very city where I was born. It sure would have been nice to see this one. During the next show, in Padova, "FOREVER YOUNG" opened the encore set of a show which also included "STANDING IN THE DOORWAY" and "I BELIEVE IN YOU". One day later, in Como, "FOREVER YOUNG" appeared four songs earlier in the show, which later featured also "EVERY GRAIN OF SAND", and as the first encore "A HARD RAIN'S A-GONNA FALL". In Córdoba, eight days later, "FOREVER YOUNG" was performed once more in the same set as "I SHALL BE RELEASED" and "GOD KNOWS"; and four days after that, in León, "FOREVER YOUNG" appeared once more in the same show as "A HARD RAIN'S A-GONNA FALL". In August 2004 "FOREVER YOUNG" was performed in Cooperstown; and two days later in Brockton, where it appeared in the same set as "GOD KNOWS", "PO' BOY", and "SAVING GRACE". More than two weeks later "FOREVER YOUNG" appeared in a show which had Bob had started with "CAT'S IN THE WELL". Four days after that, in Rochester, Minnesota, "FOREVER YOUNG" was performed in the same set as "GOD KNOWS" and "TRYIN' TO GET TO HEAVEN". During the fall tour of 2004 "FOREVER YOUNG" appeared first in Fresno, next in Berkeley, in a set including "GOD KNOWS" and "TRYIN' TO GET TO HEAVEN", then in San Diego, and in Boulder, Colorado, again in the same show as "GOD KNOWS". One week later, in De Kalb, Illinois, "FOREVER YOUNG" shared another fine set list with both "GOD KNOWS" and "NOT DARK YET". Seven days after that, in Pittsburgh, Pennsylvania, "FOREVER YOUNG" was performed once more in a Sunday show featuring "GOD KNOWS". Four days later, in Saint Bonaventure, New York, "FOREVER YOUNG" appeared in the same concert as "DIGNITY"; and one week after that, in Durham, New Hampshire, both "FOREVER YOUNG" and "DIGNITY" were performed again in the same show. Three days later, in Cambridge, Massachusetts, during the last show of the year 2004, "FOREVER YOUNG" was performed once more in the same set as "GOD KNOWS". The first appearance of "FOREVER YOUNG" in 2005 was in March in Seattle, the next was one week later, in the same set as "TRYIN' TO GET TO HEAVEN", in Oakland, where Bob dedicated "FOREVER YOUNG" to Ramblin' Jack Elliott, who was part of the audience. Eight days later, at the third of the Los Angeles shows, "FOREVER YOUNG" was performed as part of the encore. During the first show in Chicago, in April 2005, "FOREVER YOUNG" appeared in the same center section as "CAT'S IN THE WELL" and "MISSISSIPPI". Ten days later, in Mt. Pleasant, Michigan, "FOREVER YOUNG" was performed again, this time in the same set as "BLIND WILLIE MCTELL" and "SAVING GRACE". Five days after this, during the second Boston show, "FOREVER YOUNG" appeared together with "BLIND WILLIE MCTELL" and "EVERY GRAIN OF SAND". During the May to July stadium tour of 2005, "FOREVER YOUNG" was performed three times, at first together with "SEÑOR" and "CAT'S IN THE WELL"; and then twice in the same set as "A HARD RAIN'S A-GONNA FALL". In the fall of 2005, during the European tour, "FOREVER YOUNG" was at first performed in Assago, Italy, before two weeks later, at the penultimate show of the tour, it had a surprise appearance in Dublin. My wife and I were standing at the center of the rail at The Point, and were ready to go, after a great Saturday show with a mighty fine sixteen song set, waiting for the house lights to go on, but they didn't. People cheered and clapped, and surprisingly Bob and his band come back on stage, launching into a fine version of "FOREVER YOUNG", which was only the 2nd appearance of this song during the tour. So the first of the two Dublin shows was ending with Bob's eighth harp solo of the night, making this Dublin audience the only one of the tour which got to hear 17 Dylan songs. On July 2nd 2006, in Gelsenkirchen, Germany, I had the pleasure to witness the first appearance of "FOREVER YOUNG" of the year, as song number twelve, one of the biggest surprises of the night, following the first "NEW MORNING" in 2006, and also performed in the same show as the first "SEÑOR" of the year. I had last heard "FOREVER YOUNG" in Dublin in the fall of 2005, where it last had been sung before Gelsenkirchen; but I also saw the previous German performance of this song in Düsseldorf 2003. Both of them had been extra encores, but in Gelsenkirchen it preceded the closing trio of songs. The second performance of "FOREVER YOUNG" during the European tour was one week later, in Valladolid, Spain; and another week after that, in Rome, Italy, the third Sunday version of the song for the tour was sung by Dylan. Four days later, in Cosenza, Italy, "FOREVER YOUNG" was included in the last concert of the European summer tour of 2006. During the US summer tour "FOREVER YOUNG" was performed in August in Kentucky; and then a few weeks later in Connecticut. In September "FOREVER YOUNG" appeared in Pennsylvania and Minnesota. More than 18 months later, in Mexico in March 2008, Dylan chose "FOREVER YOUNG" to be the concluding song of his Latin America tour [Check out the youtube video at the bottom of this page]; and more than six months after that "FOREVER YOUNG" appeared once more, in Wisconsin. In 2009 "FOREVER YOUNG" has been perfomed once in Sweden in March, and once in California in August. The first appearance of "FOREVER YOUNG" in 2010 was in March, during the last of seven shows in Tokyo, Japan. During the European tour of 2010 "FOREVER YOUNG" closed four of the 25 shows, at first both shows in Austria, then one in France, and finally the one in England. In October 2010 Bob Dylan ended one more concert with "FOREVER YOUNG", in Chicago, Illinois. In April 2011 Bob Dylan chose to close his first two shows ever in China, in Beijing and in Shanghai, with amazingly beautiful versions of "FOREVER YOUNG". Also his first ever show in Vietnam, and both shows in Hong Kong, ended with this song, as did his concert in Singapore, before Dylan chose to close also all nine shows in Australia with "FOREVER YOUNG", as well as his concert in New Zealand. In June 2011 Dylan closed only two shows with "FOREVER YOUNG", here in Cork, and then later that month in Hamburg; and in July 2011 it only appeared in Albuquerque. In October 2011 "FOREVER YOUNG" was performed as the last song of the concert in Lille, France; and in November 2011 in London, at the very end of the last show of the year, "FOREVER YOUNG" was sung as a duet with Mark Knopfler. May God be gracious to us and bless us and make his face to shine upon us, that your way may be known on earth, your saving power among all nations. Let the peoples praise you, O God; let all the peoples praise you! Whatever you wish that others would do to you, do also to them, for this is the Law and the Prophets. … "Everyone then who hears these words of mine and does them will be like a wise man who built his house on the rock. And the rain fell, and the floods came, and the winds blew and beat on that house, but it did not fall, because it had been founded on the rock. And everyone who hears these words of mine and does not do them will be like a foolish man who built his house on the sand. And the rain fell, and the floods came, and the winds blew and beat against that house, and it fell, and great was the fall of it."